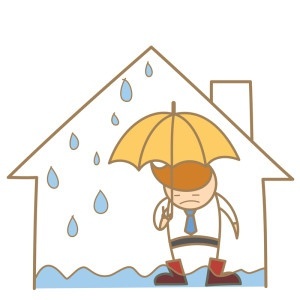 Detecting that your roof has suffered significant damage is one thing, but finding a roof leak, which has the likely potential of starting in one place and ending up in another, is a whole different beast. Roof leaks can easily become a pesty issue because it can cause extensive damage to your property. But the first step of every problem is actually detecting the problem itself. Below you’ll find all you need to know about taking the first step to uncovering your roof leak source. Follow the water. It may seem tedious and time-consuming, but tracing your water back to its point of origin is the most effective and easiest way to uncover your problem spot. If you have an attic, typically on a rainy day, you’ll be able to detect your source there. Follow the dripping and mark the spot. Now, you can do either one of two things. Wait for a sunny and dry day, have a someone remain in the attic near the leak location, while you climb up on the roof to assess the other side of the leak, or vice versa. When you get up on the roof, have your partner knock to reveal the general location of your leak source and go from there. You second option is to call your local roofing contractor, who is also a professional at finding roof leaks, point them in the right direction and have them climb on top of your roof to fix the problem. If you do not have an attic however, your investigation requires some creative detecting skills. Look for stains on your ceiling and walls, rotted framing throughout your home, mainly near the upper levels of your house, and molds are also a key sign of a roof leak. Whether you think your leak is small or considerable, it’s important that you fix the issue quick, because even small leaks can easily become a big expensive problem. All of the above are signs that your roof is suffering from an accidental leak, lack of ventilation, and too much moisture.